As a public school teacher, I had parents come to me all the time wanting tips and tricks to get their kids to read. They were often desperate to make their child love reading. All the studies show that people that read more are super humans or something. Here’s my point: as a Sunday school teacher, I’ve had exactly THREE parents ask me for tips to get their child to read their Bible. As Christians, that’s not okay. And I’m including myself in this. I love seeing my kids reading their library books and will ask every single family member to buy books for Christmas to foster their love of reading. But when it comes time to teach them to do a devotional? Well….. that makes me nervous. You see, I still struggle to make time to do my own daily devotional. This post, Best Devotional for Girls, contains affiliate links for your convenience, This means that if you make a purchase using our link, we will receive compensation at no additional cost to you. Read our full disclosure policy. We do a family devotional on most days, but even then, I sometimes miss it. Teaching kids to be good Christ followers is hard. And like every idiot in a scary movie, we sometimes just hide from the scary thing instead of grabbing our weapon and fighting back. Let’s commit to be parents that are deliberately raising kids to follow Christ – not by being hopeful that our good example will rub off on them. Because if that’s the key to raising Christians, my kids are in trouble. My example is so flawed. It’s one of the reasons I hate homeschooling. Being with my kids all day, every day, lets them see every mistake. Instead, let’s make teaching our kids to have an active relationship with Jesus a priority. Let’s make it our family culture for everyone to do their own daily devotional. And let’s start by choosing a good devotional for our daughters. This devotional is great as a first devotional. It’s a very small book and has 180 devotionals. It has a focus verse, a real-life application, and a prayer. I don’t love the prayer portion because it’s four lines and rhymes, but my daughter doesn’t seem to mind. This one is best for girls in grades 1-5 depending on her spiritual maturity. We read this one with my daughter when she was in first grade, and it went really well. We also gave copies of Three Minute Devotional for Girls to our Wednesday night GA class with 4th and 5th graders, and they all loved it. This devotional is formatted just like the Three Minute Devotional for Girls, but the content is for a little bit older audience. It has 180 devotionals. Each one has a focus verse, a devotional focused on that scripture, and a short prayer. This is a great devotional for a teen girl who is a new Christian or a Christian who hasn’t really developed in her faith. It is an easy, quick read, but provides a great way to start the day with a focus on Jesus. This devotional for girls has 100 devotional readings. Each one has a focus scripture, a devotional based on that scripture, and an activity or set of questions based on the reading. It is a pretty interactive devotional that will definitely take more than three minutes. Since it’s more of a time commitment, this devotional is best for girls third grade and up who have a hunger for the Word. This devotional for girls is written by artist Natalie Grant and has one devotional for each day of the year. Each devotional has space at the end to answer questions in the book. I really like that because then they can go back and see how they’ve grown in their faith and what prayers God has answered. With it being one for every day, this is probably not a great first devotional. This is a devotional that’s better for a girl that has already established the habit of reading her devotional independently and is ready for something a little bit deeper. Just like her other devotionals, Sarah Young writes this one in the first person as if Jesus is speaking directly to you. Each devotional has a focus verse and then a devotional written from the perspective of Jesus. It is a very reassuring and calming devotional that will take kids about two minutes to read through. This one is a great devotional to do with your kids as a conversation starter or as a first daily devotional. It has 365 devotionals so it’s a good one to start the daily reading habit. This is a great devotional for preteens or teens who struggle with their self-worth. Which is basically every pre-teen and teen that I know. 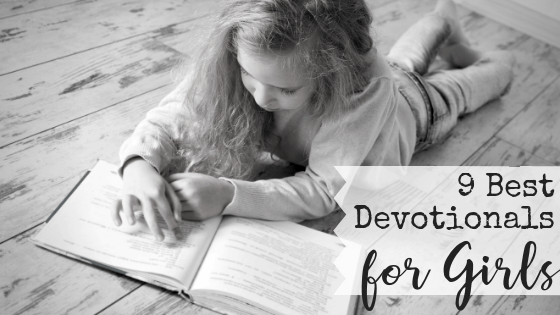 All of the devotionals focus on helping girls to see their value and worth in God and to know that they are so very loved by him. The devotionals are short with a focus verse and then a devotional with a few lines for writing. There isn’t a prompt to answer, so some girls may struggle with what to actually write. This daily devotional is reminiscent of the Chicken Soup for the Soul books that were popular when I was a teen. Each devotional is written by a different teenager and has a focus verse and then the devotional. At first, this seemed ludicrous to me. Why would I buy something for my child to read that another child wrote?? I want them to learn from mature adult Christians. I should be buying them Spurgeon and Tozar. But as I thought about the social media age we’re in, I realized that our teens are already taking much of their information from other teens. And not just in person with their real friends. So maybe a devotional written by teens is the best thing for your teen? I read through several and they were incredibly relatable and spot on in their summation of the scriptures. This book is a weekly devotional that is filled with relevant truths for the real-life struggles young women face today. Because it’s just one devotional per week, they are a bit longer than just a page, but it’s still an easy read. The author also has a weekly challenge that applies to the lesson like “This week focus on living a peaceful, drama free life.” I think it would be a great addition to have girls go back and write about how they did with the weekly challenge. This weekly devotional by Sadie Robertson (of Duck Dynasty fame) is probably the most involved devotional for girls on the list. Each devotional begins with the devotional followed by the scripture reference. It then has a Dig Deeper section with background info and a review of what they read in the Bible. It then has a Live It Out section and space for your teen to write out how she plans to apply what she’s learned. This would a great devotional for your teen that is fairly mature in their walk with Christ. In conclusion, there are a ton of great devotionals for girls. And while it may be scary to start teaching your daughter to read the Bible on her own, it is necessary. Our primary job as parents is to raise kids that can thrive without us. I want to raise a daughter that turns to the truth of scripture when she faces a problem. The best way to ensure she’ll do that when she’s grown is if I teach her that when she’s young. 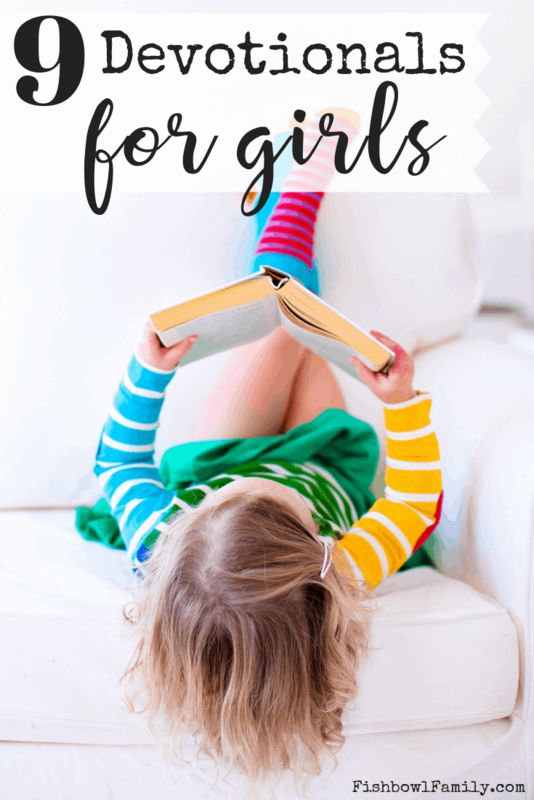 What is your favorite devotional for girls? Tell us in the comments!